Small, cluttered homes can be transformed into airy, more breathable spaces by knocking down a few dividing walls. A demolition project may seem daunting, but the average cost is just over $3,000. Just be sure to have a professional take a look before wielding a sledgehammer. Hiring a structural engineer will cost you about $500, but you’ll save yourself the headache of rebuilds, fines, or structural problems. Once you have a professional’s input, you’ll be amazed at how much larger your home seems. Without walls blocking the windows, natural dlight is able to stream in your home, making the open space seem even larger and more airy. Along with knocking down walls, you can bring natural light into your home by connecting the outdoors to your home’s interior with large patio doors. On average, you can install glass doors for about $1,600. You may even consider widening your windows to allow more natural light into your home. Look for corner storage units with shelves and cabinets to store your things without detracting from your open concept. Wall storage units are another great option. 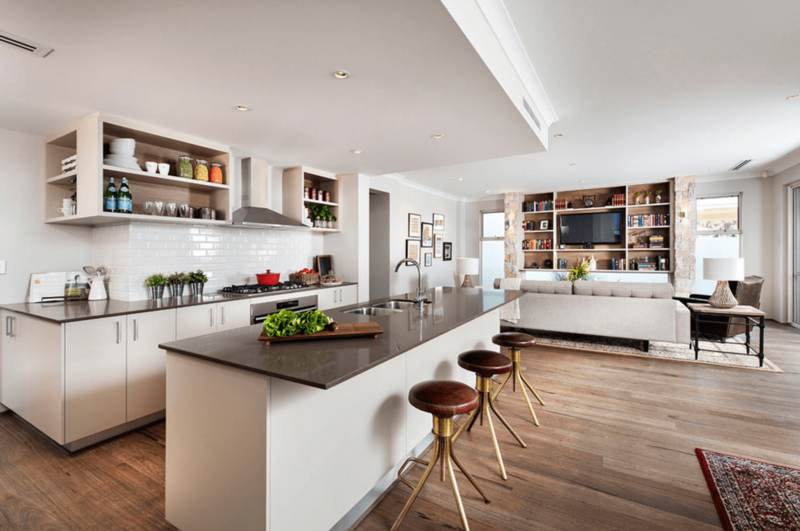 Add shelving and cabinets to a large wall to utilize vertical space up to the ceiling. This will make your great room appear taller, adding to the airiness of the design. Add drawers or cabinets beneath a staircase to maximize storage in what is often wasted or inaccessible space. This project can be done for as little as $200. Opt for convertible furniture. Consider dual solutions like an ottoman, bench, or a coffee table with built-in storage. By getting creative, you can enjoy all the benefits of your open floor plan without sacrificing storage. Many homeowners have had success opening their attics and basements to the rest of the home. The cost to convert an attic into livable square footage is an average of $49,500; however, a 2015 report by the National Association of REALTORS® (NAR) and the National Association of the Remodeling Industry (NARI) found that attic conversions retain 61 percent of their value at resale. The same is true of basements. See how one homeowner opened their basement to the rest of their home. The extra space, natural light, and social inclusivity of an open floor plan continues to appeal to buyers. In fact, increasing the light and space in your home can increase the resale value of your home. Get creative with storage, consult a professional before you knock down any walls, and enjoy your light and airy space!